The simplest and easiest way to spruce up the appearance of your house is to wash everything – the windows, the front door, porch and garage doors. You can do this with a bucket of soapy water, cloth and soft-bristled brush for external sidings or rent/buy a pressure-washer to get rid of accumulated dirt and grime for your walkways and flagstone. 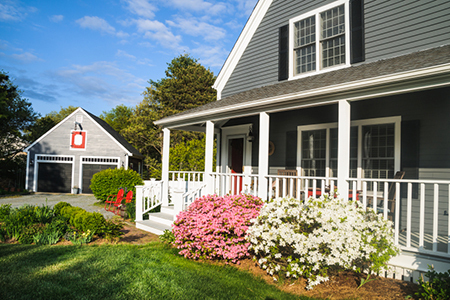 Repaint your front door and update hardware to give it a fresh new look. Make sure any damaged or sagging screens are repaired or replaced. Update your house numbers to give your entrance some style. Add or update light fixtures by your entrance. Bronze finishes compliment traditional homes, while brushed nickel accents are best suited for contemporary/modern homes. It’s important not to neglect your driveway. Make sure to rinse or sweep it regularly and reseal holes, cracks and potholes that may have accumulated over time. Clean up any fluid leaks or spills as soon as possible. Trim any overgrown shrubs, remove weeds, and tidy up planting areas. Cover bare spots with seeds and sods and don’t be afraid to plant bright, colorful flowers and shrubs to increase their appeal. Adding some garden boxes or large, decorative pots is another way to achieve this. Add landscape lighting for ambiance, appearance and safety. Check your roof regularly, at least twice per year for missing, badly curled or damaged shingles that need to be replaced. In general, asphalt shingles need to be replaced every 10 to 20 years. The national median cost of a 2,000 square foot asphalt shingle roof is approximately $8,000. Clear all gutters & downspouts of any debris that may have accumulated from the previous season. Inspect the fencing around your home, especially if any components may have moved over the winter. Check all latches and gates to ensure they are working properly. The national average cost of 4 ft chain link fence is approximately $11 – $16 per linear foot. For a 5 ft wood cedar fence, the cost is approximately $16 – $27 per linear foot. A little time and investment to spruce up the exterior of your house will ensure you are always one step ahead.